When selling an irrational buy for $7500, no reason to give free shipping? 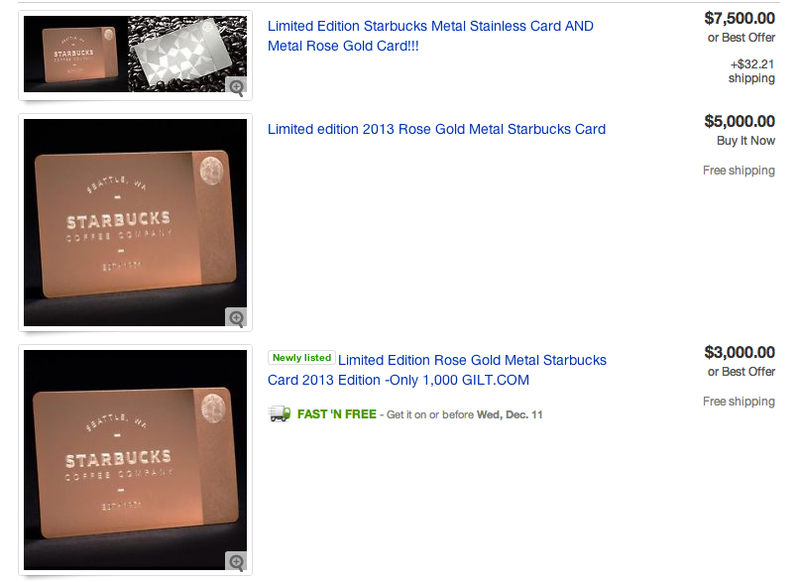 This year’s limited edition (only 1000 issued) $400 rose gold Starbucks gift cards are already on sale in eBay. Here is what the top three “Buy Now” prices look like. If there exists a customer willing to pay $7500 for a product with a book value of $400 and indeterminate (bubble like) market value, why should you throw in free shipping? I am not sure whether this seller will get their $7500 price but I like the way they are thinking about price realization. There is absolutely no reason to throw in a freebie when your customers are not expecting it. In this case it is highly likely the buyers compare prices in percentage instead of absolutes and see $32.21 as less than 0.5% of purchase price. What would be intriguing about human psychology and our predictably irrational decision making is – people willing to pay $4000 for a $400 card but insist on free shipping. This is how you do better price realization through creative packaging without upsetting customer reference price. Customers are used to $3.49 price they pay for similar almond bars but with less than half of protein. 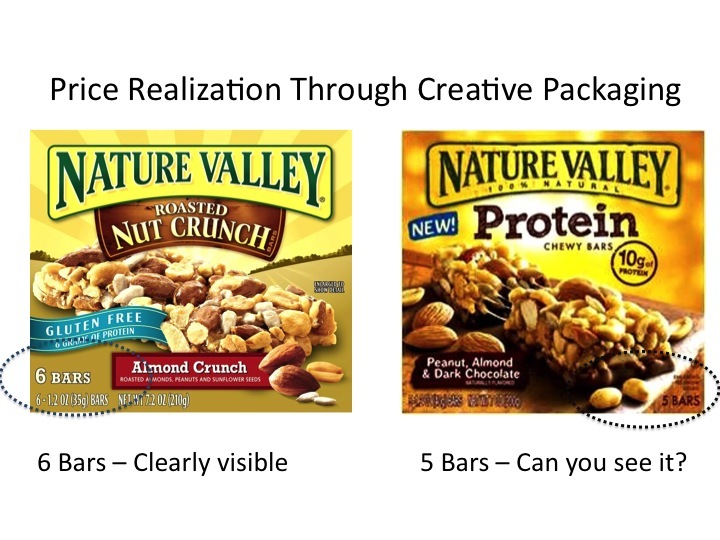 Nature Valley could have introduced the new protein bar at higher price to attract different customers. But they found it is better to appeal to their regular customers if they can get better price without unsetting their reference price of $3.49. The result is the creative packaging – maintaining same box dimensions and reducing the number of bars from 6 to 5 – a 16.7% savings in marginal cost that flows directly to profit. Did you know there were only 5 bars in the Protein bar box? I didn’t until now. And there is absolutely nothing wrong with better price realization through creative packaging. This is a guest post by Praveen Rajasekar, an aspiring entrepreneurial product marketer pursuing MBA at GeorgiaTech. This is his detailed analysis of pricing strategy change announced by JCPenney. See his full bio at the end of the article. JCPenney (JCP) unravels a transformational plan attempting to change consumer retail experience. Will its new ‘fair & square’ pricing strategy and month-long value promotions make it America’s favorite store? Perhaps, but it will depend on how effective these strategies are going to influence consumers in its target market. Over the years, we as consumers have become accustomed to sales and discounts in retail stores. For some of us, buying a product on sale provides a sense of achievement. For others, it’s just common sense because you get used to the numerous sales and promotions. 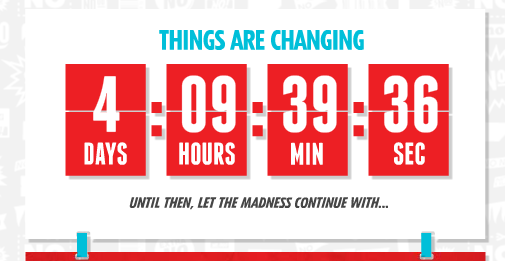 So the real question is will the new pricing and promotions at JCP change consumer buying behavior? An economist would say yes, with changes in price the quantity demanded changes. But as a marketer we are faced with irrational consumer behavior. Marketers have long used pricing as a tool to signal quality. But with numerous sales and discounts, it may become counterproductive. While prices ending in 0 are perceived to signal quality, based on the psychology of pricing, marketers have used prices ending in 9 to signal discount. JCP has done away with $X.99 prices and has decided to round them to $(X+1).00 and has also limited the sales promotions to convey ‘We are a quality (not a discount) retailer’. Everyday prices – Regular prices, not everyday low prices. Month-long values –Better prices that change monthly based on seasonal needs. Best prices –Clearance-level rates on the 1st and 3rd Fridays of every month. It also promises consistent pricing strategy across all channels whether in-store or online. What does this mean to us as consumers? Zero price discrimination. Wow, that sounds cool. But is it really enough to attract consumers? It depends. Will we buy an IZOD shirt from JCP for $40.00 at their new everyday price or wait for it to be on sale at Macy’s for $34.99 down from $60.00 original retail price? It depends on how quickly we need the shirt and whether we are willing to wait for a sale at Macys. Therefore JCP may not really win customers from its competitors overnight, using this pricing strategy. But, it has the potential to attract the customers who are in immediate need and are willing to pay the everyday prices. In addition, the new return policy allows customers to return any merchandise at any time for any reason and might provide JCP an advantage over its competitors. Apparently for JCP, past promotions did not make a big impact on sales, as it ran 590 promotions in 2011 and the average number of customer visits was only four, which implies that 99% of the times customers ignored those promotions. 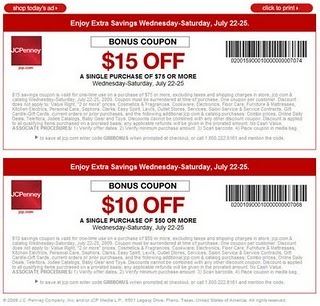 Now, JCP has decided to simplify and provide month-long promotions instead of a plethora of other promotions provided thus far. This definitely provides a level playing field for all customers. But whether the price offered during that period is within the customers’ willingness to pay is something to watch out for, especially as retailers fiercely compete for market share by undercutting each other across both brick and mortar stores and online channels. It is also critical to note the JCP with a slew of brands (including Martha Stewart® introduced at the launch event) is attempting to attract a wide range of customers. Some of whom might welcome the new changes while others still vie for more discounted brands. With such a broad spectrum of consumers in JCP’s target market it is unlikely to become America’s favorite in the near term. To do so would mean changing customer expectation of exclusive sales and deep discounts. JCPenney’s ‘fair & square’ pricing strategy appears to be part of a bigger ‘focus & simplify’ retail strategy and logically doesn’t seem radical or game changing in isolation. But with the broad promotions and personality branding, along with the future suggested changes in products and retail stores, the strategy holds promise. Especially, if consumers start realizing that JCP consistently offers lower prices in comparison to its competitors, without the hassles of coupons. As Ron Johnson articulated in the conclusion of the launch event– ‘Every journey begins with a first step! What if there were no price tags? Bio: Praveen Rajasekar is an aspiring entrepreneurial product marketer. He has an undergraduate degree in computer science and engineering. After 6 years of IT consulting for Fortune 500 clients, he is pursuing full-time MBA at Georgia Institute of Technology, focusing on Marketing and Strategic Management. He is a Warren Batts fellow in the TI:GER® (Technological Innovation: Generating Economic Results) program, developing business plan and go-to market strategy for new research technology. He is an avid foodie and vivacious volleyball player. Previously I wrote about the self-serve frozen yogurt stores in the context of creative packaging for better price realization. To refresh your memory, these self-serve frozen yogurt stores price and sell yogurt based on weight. They give you a container and ask you to fill it up with any one of the many flavors and toppings and then charge you one single price per unit weight. The hypothesis I made then was that self serve option made customers spend more then they imagined they would. To be sure, it was based on a single visit to one frozen yogurt store. With weight-based pricing, the average self-serve ticket is $6.32, compared with $5.61 at a traditional store, says a TCBY spokeswoman. First, is that increase all due to self-serve? The WSJ article calls it, “giving power to people”? Do we feel so empowered that we end up spending more? Is this because we feel less comfortable asking someone behind the counter for something we desire? I can hear Customer service and “co-creation” evangelists jumping to big conclusion about the incremental profit from customer empowerment. The answer is not straightforward. While the customer spend numbers may be based on TCBY observing years worth of data from its many stores, it is not correct to attribute causation to mere customer empowerment aspect. Data may fit one hypothesis but it can also fit any number of plausible hypotheses. Another hypothesis is the one due to the shape of the container. The containers used in all these self-restaurant have a common pattern. They are all much wider than the containers we see in traditional yogurt stores. As the research by INSEAD and by Brian Wansink indicate, we lose our ability to judge volume with wider containers. In addition wider bottom nudges us to cover the entire bottom and then build on it. It surely would feel odd to have yogurt in just one small area of wider bottom. In addition we also do not know how much we spent. It is not that we are adding one scoop at at a time. We do not know the concept of weight. So by the time we take the container to the counter to pay, we have no idea of the price we are going to pay unlike traditional places that list the price right upfront before we make the decision. The net result is we end up filling up lot more than what we likely want to eat and spend lot more than we normally would do at traditional yogurt places. To say, “power to the people” (or “co-creation”) is the reason for higher spend is not correct unless someone can do multiple different experiments and run step-wise regression to find out what percentage of changes in average spend can be attributed to “the feeling of empowerment from self-serve”. Second, should you as a small business considering yogurt store opt for self-serve model over traditional store? Talk to me, I can help you run a model to see if that is the case. How will iPad2 be priced? 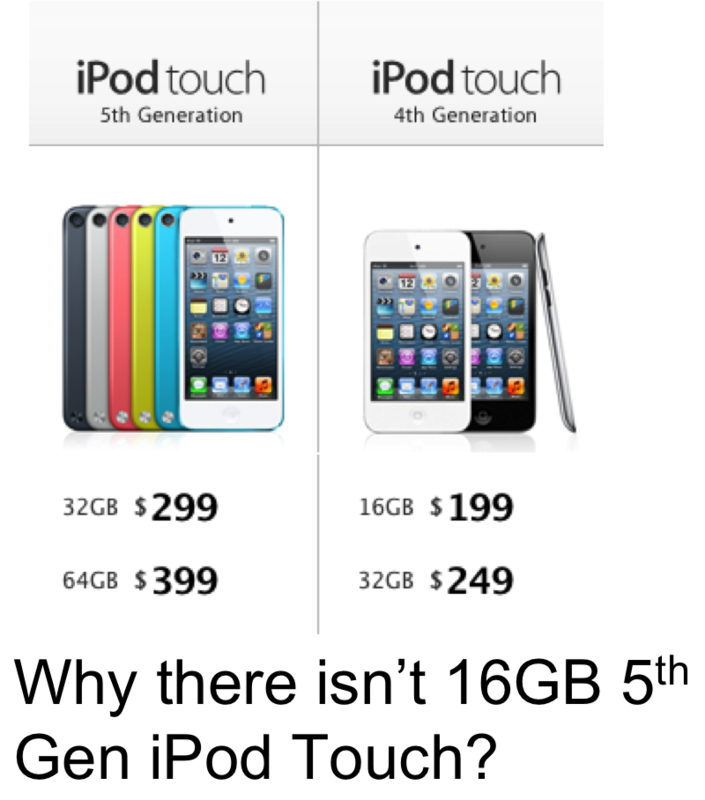 Update on 9/13/2012: While this article is dated, look at this in the context of 5th generation iPad Touch pricing. Apple kept their 4th gen iPad touch, the 16GB and 32GB versions and only introduced 32GB and 64GB versions for 5th gen. As you read this article you will follow their likely reasoning. I do not know more about iPad2 or its release date than what is already known through news media. However, I am here to make predictions about how iPad2 will be priced. Given than even iPod Touch has retina display and front/back cameras for Facetime, it is a safe bet that iPad2 will have these features as well. Traditionally, when Apple introduced nextgen of any of their product they added lot more features but kept the price the same. So will a new iPad with additional features be offered at current prices of $499, $599 and $699? However, the low prices of iPad have set a strong reference price. One way to break this reference price is to maintain the clear value difference between the old version and features in the newer version. They also will make visually distinguishable difference between iPad and iPad2 (say using colors or otherwise). By offering the “crippled” (not really, figuratively speaking) older version along side higher priced and richly featured newer versions, they let their customers self-select themselves to the one they are willing to pay. This however does not mean offering 6 versions (as there are cognitive costs to customers). So here is my prediction for iPad2 versions pricing. Update 8/31/2011: I was surprised to read that there are still seven-story apartments in New York that do not have elevators and still rent to people. As you will expect, despite the location, the view and the benefits, these apartments are a bargain to those willing to hike 192 steps to get to their home. Apartments that go for $3500, go for $2000 – all because of no elevator. Imagine you owned a five story building in 1850 New York, years before the Elevator or more importantly the Elevator brake was invented. Despite the unobstructed views and the status the top floors provided you were not able to charge much for the rent. There was clear value in the top floors and better yet there was more of it to come if you were to build more floors. Yet, no customer, except those in the most athletic form or those in dire need of a place with cheap rent, was willing to see that value and pay a price for it. What use is a feature when its value cannot be realized or the cost to use the feature far outweighs the value? In the case of tall buildings, it all changed when Elisha Otis invented a safe way to stop elevators and these stopped being death traps. An invention that had nothing to with you or your own efforts ended up unlocking the unrealized value from these top floors. Fast forward to present day. You have a product that you know adds considerable value to the segment of customers you are targeting. Yet customers do not see it that way. Your own sales team do not see the full value. Definitely your competitors are making sure it stays that way. You can improve your value messaging to help reduce the selection cost, credibility gaps, risk aversion and reference price effects. Yet, no amount of value communication from you is going to help reduce the cost of doing business – the effort customer needs to exert to use your product. You need an elevator to climb back up the staircase. Something that makes it very easy for your customers to adopt and use your product without changing their behavior, business process or the way things are usually done. Unfortunately there is no Otis to invent a generic one for everyone. It is you who have the task of making it very easy for your customers to use your product. Until that elevator is invented, your product’s value and price remain unrealized.